I haven't been able to shake the thoughts from what happened last Monday at the Boston marathon. It was and still Is something that shook me to my core. As I mentioned a few times I feel the bombings weren't an attack on runners, but an attack on innocent people. it could have (unfortunately) happened anywhere at any event. 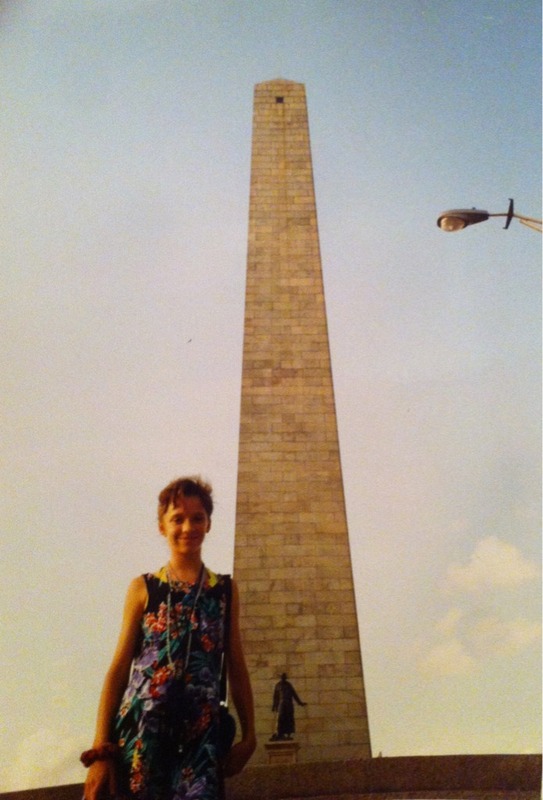 I've got a lot of memories in Boston because my Daad is from there, and because L also has ties to the area. Boston is a wicked awesome city. 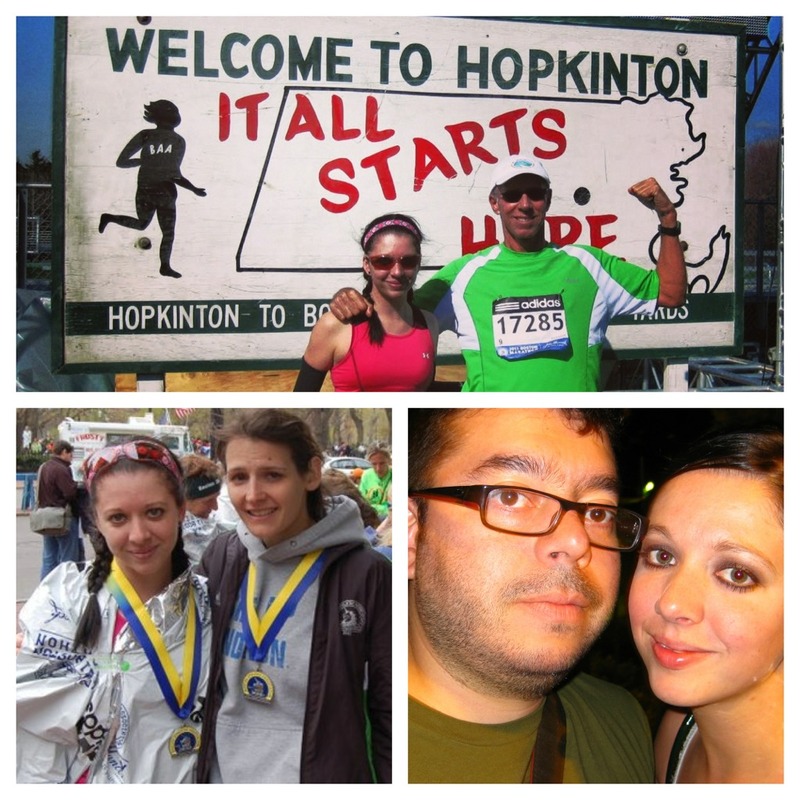 Running the 2011 Boston Marathon with Daad & Tribu, and spending 4th of July 2010 with L in Boston. 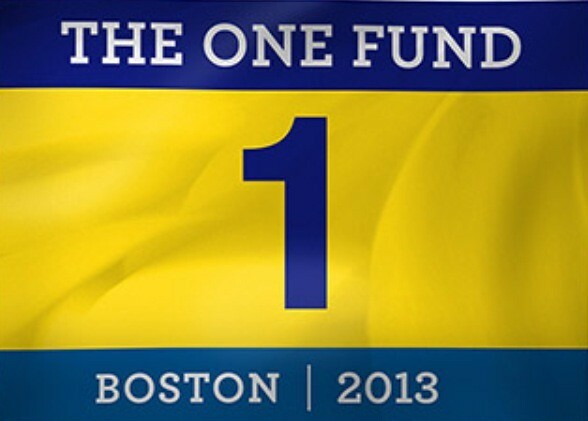 I wanted to do something to aid the survivors of the tragedy, I have decided to donate one dollar for every mile I run for 2 weeks to The One Fund. My Daad sent me some old photos recently which put a huge smile on my face. Powering through a drainage ditch. Belch. I ran XC 2 years (sophomore & junior) in HS, was plagued with injuries and eventually quit to focus on music my senior year. I improved a lot over the 2 years- my very first race in 1997 I ran 30:00 for 3 miles, and then was Injured the entire year. I was an expert at strength training & pool running and came back the last race of that season with a 24:00. The 1998 season afforded me more races & slightly less time being injured. I dropped my time to 20:59 for 3 miles. (I wish I kept better records of my times!) I was nowhere near the fastest runner on our team. 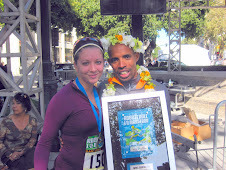 I sometimes helped our team out being the 4th or 5th finishing runner on varsity. I'm thinking this year I might finally run faster than 7 minutes a mile in a 5k & beat my 15 year old PR. I wonder if any of my old teammates are still running races. 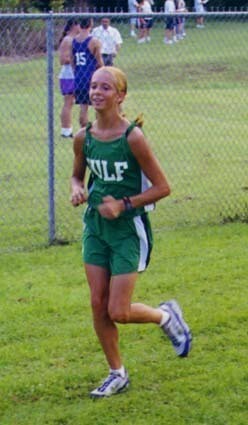 Running with a big goofy smile since the beginning. I think "quitting" running for a while helped me physically. I'm sure my best days of running are still ahead of me if I stay injury free. 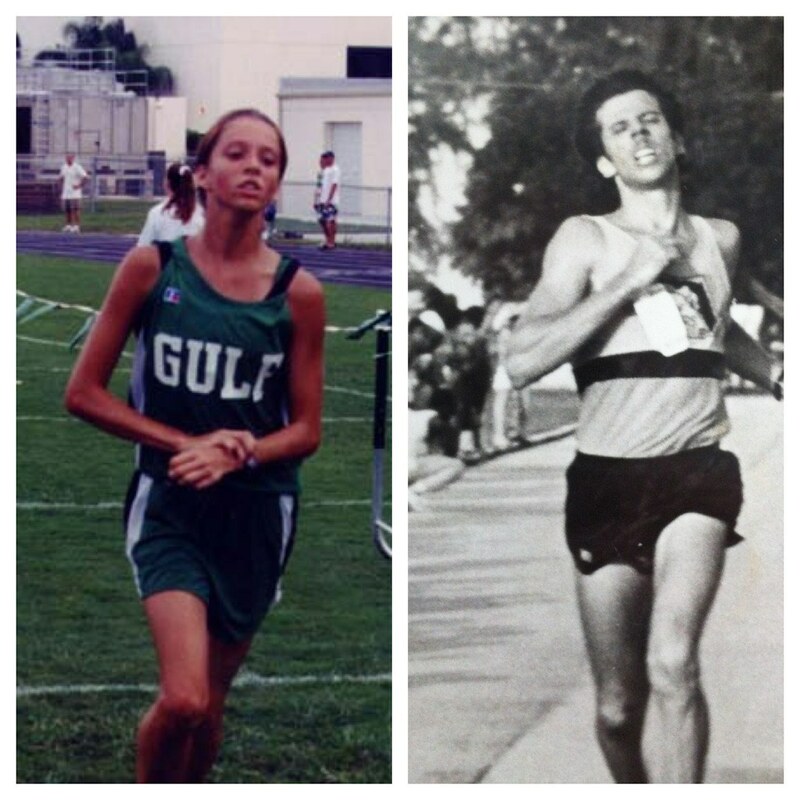 Did you run cross country or track in high school? -I wish I had stuck with track in middle school. But all I did was 2 seasons of XC in HS. Is your hair blonde??? Like how even back then you had that knifty side kick ;) Think that this for sure is your year for that sub 7 5k pace, you are on quite a roll lately! Love the pic of you swim running. Wish I had photos from back then, but I think I only have 1 & its hanging on a wall at my parents. Makes me feel ancient when I see it. Hang in there lady! Think you're doing a good thing. Boston's events have played with my emotions quite a bit too, haven't really been able to get my head around it and the feelings it has been stirring up. Just. Keep. Running. Agreed. I wish 'some' people out there would quit talking about it as if it was all about runners. It had NOTHING to do with runners, but with Americans. I love all the throw back pics! Ahh! Your knee is behind your other knee.. behind you! Crazy runner form! Love it! Do you keep in touch with any of your fellow XCers? It would be interesting to hear what they were up to. You are such a dedicated strong runner. I bet this is the year you go sub 7:00 at the 5K! You put in the work! All you need is a flat course, a non windy day, and some good weather. Hee hee. I do find it confusing to me, seeing all the talk about Boston and "runners aren't the group to mess with," stuff. Some of it makes me think "Rah rah, I love runners" but I am sometimes conflicted with, well, it wasn't an attack on runners, just an event with a lot of people. Anyway. You know all about that. I would love to visit Boston one day. I would love to hear more about your favorite things there! I was just going through some old photos today too! I love these pictures of you! Are you wearing a hemp necklace in one of those photos? A sign of the times. Lol! So funny how we see things differently later in life. You can still get speedier! I think none of us have reached our full potentials as runners yet :) Im sure your baby W will love running because of you. Wow, you were a lot cooler than me in the early 90's :) That's a wicked rad outfit in that first pic! And that's so cool that you ran Boston with your dad! My parents aren't athletic, so I can't even imagine what a neat experience that must have been. I didn't do any sports in high school (unless you count archery and fencing in gym class!). But I was in every possible music group we had - orchestra, a jazz group, pit orchestra in our musicals, and the liturgy group (yep, Catholic school) - as well as academic clubs. Soooo I was a pretty cool kid and not nerdy at all. Archery & fencing sound cool! So cool you ran in college too! You need to scan those photos- having a book with the photos/articles is awesome! I was so happy my dad found the cd of photos :) great memories! Love all the great pictures of you from high school! 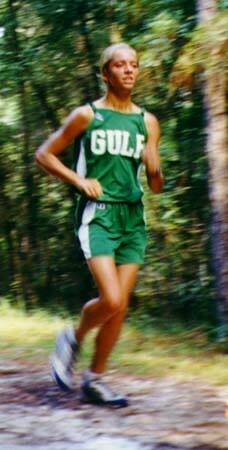 I started running track in 7th grade, and was never fast, nor good...LOL. Thanks for sharing these old photos and letting us into your life. Love it! 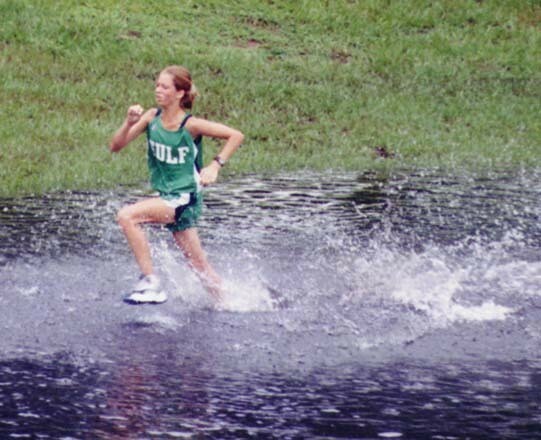 Always fun to see old HS XC and track pics. Were you on the bottom right in that group team pic? Your running form really is kind of crazy, but as long as it works for you, I wouldn't change it! I did XC for 2 years, and track for 4 years in high school. Some of my best friends are still from the track team. High school is where I was my fastest, but like Christy said above - I wasn't as mentally strong as I am now. But in high school it is hard to handle the workouts mentally sometimes. Nice pictures! I ran track in 7th grade and cross country in 7th and 8th grades. I wasn't very fast, and preferred team sports, so I played volleyball and soccer in high school. 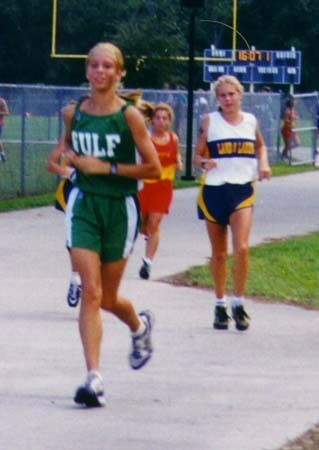 I think I have one picture from a cross country meet in junior high though, I should scan it. I'm running in knock-off converse high tops. These photos are amazing! I love that you've always been smiling:) I ran track and x-country in middle school but focused on basketball and soccer in HS!